This page outlines the history of Paxman's involvement in diesel-electric marine propulsion over seventy years, from 1930 to the beginning of the new millennium. Some information which appears on other pages has been repeated here where necessary to provide a coherent account of the Paxman diesel-electric marine propulsion story. The Company received its first order for engines for a diesel-electric propulsion system in 1930. The engines were for DEV Lochfyne, the first diesel-electric passenger vessel to operate in British coastal waters. Paxman's entry into the field of diesel-electric marine propulsion came just three years after the Company launched its first compression ignition (diesel) engines. Work had started on a crude oil engine, presumably a horizontal type, as far back as 1913/14. That project was brought to a halt by the 1914-18 war and Paxman's heavy war work commitments. Development of a compression ignition engine, this time a vertical type, was not taken up again until 1925. After two years of tests and trials, Paxman's first diesel engines were publicly launched in 1927, being shown that year at the British Industries Fair, Birmingham in February and the Shipping, Engineering and Machinery Exhibition, Olympia in September. What were the factors which led Paxman to recommence oil engine development in 1925? Why did it go for a vertical rather than the more conventional horizontal design? How did it become interested in marine propulsion, particularly diesel-electric arrangements? There would appear to have been at least two key factors at work. One was Edward Paxman, youngest son of the Company's founder. Another was Paxman's membership of the engineering combine, Agricultural & General Engineers Ltd (AGE). Edward Paxman had graduated from Cambridge with 1st Class Honours in Mechanical Engineering in 1923. He then spent probably about a year at Metropolitan-Vickers Electrical Co, Trafford Park to acquire some practical training and industrial experience. The time at Manchester would have given him a useful grounding in electrical machinery, such as generators and electric motors, with a leading manufacturer in the field. This exposure must surely have influenced his thinking about the potential of diesel-electric systems and allowed him to forge useful contacts. All the electrical machinery in Lochfyne, Paxman's first diesel-electric project, was supplied by Metropolitan-Vickers, as was that in some subsequent Paxman-engined diesel-electric vessels. After Manchester, Edward Paxman moved on to Blackstone & Co at Stamford, a company which like Paxman was part of the AGE combine. Blackstone was a major manufacturer of compression ignition oil engines. It seems reasonable to assume Stamford was where Edward acquired his first real experience of diesel engines and where his enthusiasm for this type of engine was kindled. However the link with Paxman is far more substantial. In 1924 Blackstone had launched its new spring-injection device which it then incorporated in all its engines. Spring-injection was a major advance on air-blast fuel injection which at that time was the norm for larger oil engines. It was the new Blackstone system which Paxman used under licence in the engines it started to develop in 1925. It is almost inconceivable to imagine that Edward Paxman was not closely involved in the Company's adoption of Blackstone's spring-injection. What initially seems surprising is that Paxman was allowed to use Blackstone's spring-injection just a year or so after it had been launched. Why was Blackstone apparently willing to surrender the competitive advantage of such a valuable innovation by allowing a potential competitor to use it? As previously mentioned, Paxman and Blackstone were both members of AGE. Marketing policy and competition issues were decided centrally by AGE rather than locally by individual member companies. A fundamental AGE policy was that member companies should not compete against each other but operate in different markets, as allocated by AGE. Blackstone's engines were of the horizontal type whereas Paxman developed the vertical type. With each type aimed at different markets, allowing Paxman to use Blackstone's spring-injection in vertical engines would be consistent with AGE's overall business strategy and avoid Paxman encroaching on Blackstone's horizontal engine market. Without more evidence we can only speculate on Paxman's principal reasons for deciding to build the vertical type of engine. By the early 1920s it must have become uncomfortably clear to the Company's management that the steam engine was rapidly being overtaken by the oil engine as the preferred prime mover in many of Paxman's existing markets. There was a pressing need for Paxman to develop a range of oil engines as sales of its steam engines declined. Taking advantage of Blackstone's state of the art fuel injection technology, but in a way that did not place the two companies in too much competition with each other, must have looked an attractive solution. What is less obvious is the extent to which Paxman was conscious of, and motivated by, the potential advantages of the vertical over the horizontal for certain markets and had identified the potential of the marine market. Certainly the marine market was in its sights by the time the new verticals were introduced in 1927. One of Paxman's first catalogues for this type of engine (publication No 931, dated 1927) is entitled 'Marine Oil Engines'. It is also pertinent to note that during the launch year Paxman chose to exhibit at the Shipping, Engineering and Machinery Exhibition, as well as the British Industries Fair and the Royal Show. The horizontal oil engine was not well suited to marine applications. Two of the most important considerations for any ship installation are size and weight. Relative to its power output the horizontal engine occupied a large floor area and was very heavy. Further, for propulsion purposes the general layout of the horizontal did not easily lend itself to coupling the crankshaft in line with the propeller shaft. Among other things, such an arrangement would result in the engine's centre of gravity being well to one side of the vessel's centre line. In contrast the vertical engine, whilst requiring greater headroom, had a smaller footprint and was potentially much lighter, giving a better power to weight ratio. It also did not pose the centre of gravity problems which would have accompanied the use of a horizontal engine. It would appear that Paxman's early success in establishing itself as a supplier of engines for diesel-electric propulsion, and for marine applications generally, was largely attributable to Edward Paxman. His interest in developing the Company's early diesels led to the introduction of engines well suited to this market, and he himself energetically pursued sales opportunities with shipowners and shipbuilders. Thus the foundations were laid for the Company's growing experience and reputation as a supplier of engines for diesel-electric propulsion and other marine applications which enabled Paxman to secure valuable marine business throughout the rest of the 20th century. In modern multi-engine installations, engines can be cut-in or cut-out depending on the power output required at any point to achieve more economic running. The progress of Paxman's involvement with diesel-electric marine propulsion is charted below by reference to vessels equipped with the Company's engines for this type of propulsion, from DEV Lochfyne of 1931 to RV Triton launched in 2000. The listing is not a complete record of all such installations and is probably not in entirely chronological order. One of the interesting features is the diverse range of applications, from ferries large and small, submarines and surface naval ships, to tugs, dredgers, a distant water fishing trawler and a floating crane. for an explanation of Paxman engine designations and how to interpret them see Codes for Paxman Diesel Engine Types. Built by William Denny & Brothers Ltd of Dumbarton for David MacBrayne (1928) Ltd to operate on the Clyde and the West Coast of Scotland. Lochfyne entered service on 8th June 1931 and was the first British coastal passenger ship to be fitted with a diesel-electric propulsion system. LOA 214', beam 30'; cruising speed 16 knots; twin screw. Electrical Machinery: Each engine coupled to a 520 volt DC generator, rated at 520kW, supplying current to two 670 hp, 520 volt DC propelling motors with a full load speed of 433 rpm. The control system varied the magnitude and direction of the generator field current, and hence the voltage applied to the propulsion motor, power and speed being directly proportional to the magnitude of this voltage. All electrical machinery manufactured by Metropolitan-Vickers Electrical Co of Trafford Park, Manchester. Designed by Graham Robb & Woolnough of Liverpool and built by William Denny & Brothers Ltd of Dumbarton for David MacBrayne (1928) Ltd to run on the West Highland service. Lochnevis had accommodation for 700 passengers and entered service in the summer of 1934. LOA 175', beam 31'; scheduled speed 15 knots. Engines: Two 6 cylinder monobloc MY engines, marine versions of the 13" bore x 16" stroke VY engine, each rated 650 bhp (continuous) at 500 rpm. The engines, Nos 24246 and 24247, were despatched from Colchester in May 1934. They were fitted with Bosch type fuel pumps driven from the camshaft through rockers. An unusual feature of the installation was the engine's spring mounted box girder bedplate, designed to minimise vibration. Two 3 cylinder 75bhp Paxman MZ auxiliary engines were also installed, coupled to a 50kW generator and a Reavell HCSA 3½" compressor. Electrical Machinery: Each main engine coupled to tandem generators, a 425kW, 500 volt, separately excited main generator, and a 50kW auxiliary, running at 500 rpm. The main generators supplied power to two separately excited shunt motors, each with an output of 525 shaft horsepower at 400 rpm and directly connected to a propeller. Both motors could be fed from either generator. All the electrical machinery was manufactured and supplied by the General Electric Company. Two paddle wheel driven ferries, completed by William Denny & Brothers of Dumbarton in 1934, to provide additional capacity on the Firth of Forth crossing at Queensferry, north of Edinburgh. 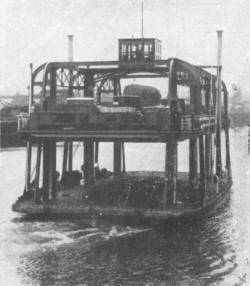 They were the first diesel-electric paddle ferry boats to be constructed for service in the British Isles. Built to carry vehicles and foot passengers, the ferries were of basic design but highly manoeuvrable: an occasional party piece of their captains being to weave in and out of the arches of the Forth railway bridge. 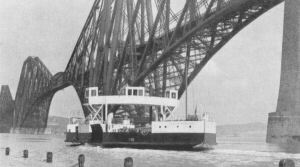 'Queen Margaret' and 'Robert the Bruce' remained in service at Queensferry until the opening of the Forth Road Bridge in autumn 1964. LOA 149', beam 28', breadth over sponsons 47' 8". Engines: Each vessel was fitted with two 8 cylinder MZ engines, marine versions of the 6½" bore x 10" stroke VZ engine, with individual ratings of 175/192½ bhp at 750 rpm. The four engines were despatched from Paxman during January 1934 and records suggest they were the only 8 cylinder MZs ever made. Electrical Machinery: The propulsion motors had a speed of 270 rpm at full power. Each motor was coupled through chain gearing to one paddle shaft, giving a paddle wheel speed of approximately 45 rpm at full power. The main generators and the rest of the electrical equipment were manufactured by Metropolitan-Vickers Electrical Co of Trafford Park, Manchester. Built around 1936 by the Smith Dockyard Company for the Erith & Dartford Lighterage Co Ltd, Sir Montagu was the first diesel-electric tug to operate on the River Thames. She had a gross weight of 61 tons. Engines: One 8 cylinder MX main engine, 9½" bore x 12" stroke, with a rating of 440 bhp at 650 rpm. This engine was direct coupled to a 290kW GEC tandem generator. The tug also carried a single cylinder RQ auxiliary engine, producing 11 bhp at 1,000 rpm, coupled to a 110 volt 5kW generator, a Reavell air compressor and a Hamworthy bilge pump. Built for the Clyde Navigation Trust by Ferguson Brothers (Port Glasgow) Ltd and completed in 1938, this vehicle ferry plied between Govan and Partick, in Glasgow. The passage time was estimated to be about two minutes, followed by a four minute wait at the end of each journey. Because of the rise and fall of the tide, about 12 foot at the crossing, the vessel was equipped with an elevating platform which could be raised or lowered to the level of the quay at all states of the tide. The ferry had twin screws at each end but no rudders, being steered solely by the screws. Bridge control was employed both for the electrical equipment and the engine governors. LOA 82', beam 44', depth 12' to main deck. Engines: Two 6 cylinder MX main engines, 9½" bore x 12" stroke, each with a rating of 250 bhp at 500 rpm. Idle speed 150 rpm. Servo governors. Bosch type fuel pumps driven direct from one end of the camshaft. Fresh water cooling, using a heat exchanger cooled by sea water. 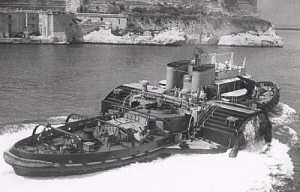 The vessel was also equipped with two 6 cylinder Paxman-Ricardo RQ auxiliaries, each rated 33 bhp at 550 rpm. Electrical Machinery: Each main engine direct coupled to a 160kW, 440 volt generator supplying current to two 200 shaft horsepower 220 volt propulsion motors, running at 600 rpm. Each motor drove a forward and aft propeller through enclosed reduction gearing. The constant current system of electrical control was employed, the two propulsion motors being connected in series and operated from the two specially wound generators in parallel, the speed and rotation of the motors being controlled by varying and reversing the motor fields. The auxiliary engines powered 20kW generating sets. All the electrical equipment was supplied by the General Electric Company Ltd.
A small diesel-electric vehicle and foot passenger chain-ferry which operated on a service between East and West Cowes. It was probably built by J Samuel White & Co Ltd in about 1938 for the Cowes Ferry Committee. Engines: Twin Paxman-Ricardo 2 cylinder RQ, each developing 27 bhp (16kW) at 1,250 rpm, coupled to English Electric generators. The first British submarines with diesel-electric propulsion. They were the Royal Navy's only diesel-electric submarines until the post-War P and O Classes and then the Upholder Class. Paxman built the engines for all the U Class (except Una and Umpire) and V Class boats. Deliveries of engines for the U Class commenced in 1938. The V Class boats were ordered in December 1941. Engines: Two 6 cylinder engines per boat. Initially these were built by Paxman to an Admiralty design which had a fabricated main frame and an output of 307 bhp at 600 rpm. Eight Group Two U Class boats, ordered from Vickers Armstrong in July 1941, and the 22 V Class were fitted with Paxman's own 6RXS engine. Specially developed for submarine service, the 6RXS had a fabricated (i.e. welded) steel frame which was able to withstand the shock of underwater explosions better than a cast one. More powerful than the Admiralty design, the 6RXS developed 400 bhp at 825 rpm. The engines were made in pairs, left and right handed, so that all controls were between the two engines. Electrical Machinery: Each engine was coupled to a 275 kW generator by a Wellman-Bibby flexible coupling. The propulsion motors were supplied by the General Electric Company. Those in the U Class had a combined rating of 825 bhp, and in the V Class of 760 bhp. A single-screw 350 ton grab dredger built for the Mersey Docks and Harbour Board by Lobnitz & Co of Renfrew. Completed in 1949, it had diesel-electric arrangements for main propulsion and dredging. Engines: Two 6RPL engines, each developing 390 bhp at 520 rpm. These were delivered in October 1948. Two twin-screw triple-grab dredgers built for the Mersey Docks and Harbour Board by Ferguson Brothers of Port Glasgow. Completed in 1948 and 1949 respectively, they were built for service on the River Mersey. Engines: Three pressure-charged vee 12RPL engines per dredger, each developing 780 bhp at 520 rpm. Also one 4RQ auxiliary per vessel, developing 35 bhp at 800 rpm driving a 20kW Metrovick DC generator. Electrical Machinery: Three Paxman-Metrovick generating sets per dredger. Each set comprised a 12RPL engine driving tandem generators, 450kW (750 amp, 600 volts) for propulsion and a 62.5kW auxiliary, at 520 rpm. Mersey 26 was the first application in the UK of the controlled constant-current principle developed by the Metropolitan-Vickers Electrical Company Ltd of Trafford Park, the company which manufactured all the electrical equipment for both vessels. Two ferries plying between Hong Kong and Kowloon which were re-engined by the Hong Kong and Whampoa Shipyard for the Star Ferry Company. One vessel was MV Electric Star in which the Paxman-engined generating sets replaced Crossley Premier diesels and BTE electrical equipment which had been removed by the Japanese during the occupation of Hong Kong. The Electric Star was the Star Ferry Company's first diesel-electric vessel and was built in 1933. Paxman's engine history card indicates a subsequent name change to MV Weathertite Prince or Princess (or both?) but whether the vessels were scrapped and the engines fitted in other vessels, or whether the vessels were sold and renamed, is unknown. Engines: Two 12RPHZ Series I engines per vessel. These were ordered and despatched in 1949. Electrical Machinery: Each engine driving tandem generators, 190kW for propulsion and a 50kW auxiliary, at 1,000 rpm. Electrical machinery supplied by the Metropolitan-Vickers Electrical Company Ltd of Trafford Park, Manchester. The two Metrovick propelling motors were rated to develop 370 shp at 250 rpm when supplied with a current of 625 amp at 475 volts, and capable of sustaining a continuous overload output of 420 shp (490 volts, 690 amps). Built c.1956 by Ateliers et Chantiers de la Seine Maritime for Pêcheries de Fécamp of France to operate in Newfoundland waters. At the time, one of the largest diesel-electric trawlers in the world. The diesel-electric arrangement successfully met the need for a high passage speed (12½ knots when loaded) combined with a low trawling speed (3 to 4 knots). The average trip was of 100 to 120 days duration, only 16 of which were on passage to or from the fishing grounds. LOA 245', beam 37' 9", draught 19' 4". Engines: Three 8YLCM, ordered from Paxman in 1955 and despatched in June the following year. For some unknown reason the contract specifies that the engine nameplate be inscribed 750 bhp at 750 rpm but that the actual contract rating was to be 800 bhp (543kW electrical) at 800 rpm. Electrical Machinery: Each engine coupled direct to Sautter-Harle tandem DC generators, 510kW for propulsion and 150kW for other requirements. Two propulsion motors, each rated 960 bhp at 850 rpm, driving through reduction gears to a single propeller. Seven paddle tugs built for the Royal Navy, with the main role of providing berthing assistance to aircraft carriers. The very wide beam over the paddles allowed the tugs to tuck under the protruding flightdecks of carriers without catching their funnels. Dexterous, Director, Faithful and Forceful were built by Yarrow Shipbuilders at Scotstoun in 1957. Griper and Grinder were built by William Simons & Co at Renfrew in 1958. Favourite was built by Ferguson Brothers of Port Glasgow and launched on 1st July 1958. She was scrapped in 1980. LOA 157', breadth 60', draught 10', 473 grt. Engines: Four 12YHAXZ per vessel, each with a 24 hour rating of 585 bhp at 1,000 rpm. The engines for Favourite were ordered in January 1956 and despatched in December 1957. Electrical Machinery: Each engine coupled to a 340kW generator. Two 600 volt DC propulsion motors per vessel, each producing 800 bhp at 212 rpm. The electrical machinery and control gear were manufactured by British Thomson-Houston. Two French Government meteorological vessels built c. 1958 by Forges et Chantiers de la Mediterranee of Le Havre. Engines: Three 8YLCZ per vessel, each rated 860 bhp (600kW electric) at 720 rpm and 940 bhp (655kW electric) at 900 rpm. The engines for France I were sent out in June 1958 and those for France II in October that year. Electrical Machinery: Tandem 220kW AC alternator and a DC generator manufactured by Jeumont; the AC supply for the services load and the DC for the propulsion motors. A Paxman file note says that the alternators were to run at 720 rpm which would indicate that the higher 900 rpm power rating would be for propulsion power only. The vessels would be required to spend long periods on station, presumably in the mid-Atlantic, where one engine would be run to provide electrical power for services and a small amount of propulsion power to enable the vessel to hold its position against wind and current. When travelling to or from station much more power would be required and two or three engines would be run with only one running at 720 rpm. A twin screw 60 ton floating crane built by Lobnitz & Co of Renfrew in 1959 for Mersey Docks & Harbour Board, Liverpool. Engines: Two 12YLXZ, each developing 874 bhp at 600 rpm. The engines were despatched from Colchester in September 1959. Electrical Machinery: Each engine driving tandem GEC generators, one 330kW, 440 volt DC for propulsion and one 300kW, 220 volt for lifting duties. A twin screw dredger built for the Mersey Docks & Harbour Board by Ferguson Brothers (Port Glasgow) Ltd in 1961. LOA 274'. Speed 13¼ knots when loaded. Engines: Three 16YLCZ main engines, each developing 1,994 bhp at 750 rpm, and a 4RPHZ auxiliary, rated 133 bhp at 1,000 rpm. Electrical Machinery: Each main engine driving a GEC tandem generator, 940kW and 450kW. Auxiliary driving a 75kW generator. A twin screw ferry designed to carry 70 cars and 300 passengers. She was built by Halifax Shipyard, Nova Scotia for Canadian National Railways to operate on the Northumberland Strait crossing between Borden, Prince Edward Island and Cape Tormentine. Launched on 5th March 1962 she was, according to a Canadian website, in service from 1962 to 1975. Engines: Four 12YLCZ main engines, rated 1,300 bhp at 750 rpm with an overload rating of 1,560 bhp (1,038kW electric). One 6RPHZ auxiliary driving a 150kW generator. The YLCZ engines were despatched in January and February 1961. Electrical Machinery: Each main engine driving a single bearing DC generator, producing 865kW (continuous), supplied by the Canadian Westinghouse Corporation. Built by Canadian Vickers for the Canadian Department of Transportation. The vessel had ice-breaking capabilities and entered service c.1962/63. Engines: Two 12YLCZ, each developing 1,200 bhp (continuous) at 800 rpm and 1,320 bhp overload. These engines were despatched from Paxman in May 1962. Electrical Machinery: Records suggest that the alternators were of Canadian General Electric Company manufacture and coupled to the engines at the Canadian Pacific Railway's Angus Workshops in Montreal. The two 810kW propulsion motors were supplied by Canadian Vickers. A distant water stern trawler designed and built for Ross Trawlers by Cochrane & Sons Ltd of Selby. Installation of the main engines was carried out by Drypool Engineering & Dry Dock Co Ltd of Hull. Engines: Three 8YLCZ, each rated 1,135 bhp at 1,000 rpm. These engines were despatched from Colchester during February and March 1964. Electrical Machinery: Engines driving tandem generators, 445kW DC generators for propulsion and 200kW AC alternators for the service load. Electrical machinery manufactured by Laurence Scott & Electromotors of Norwich. The propulsion machinery had a one hour rating of 480kW. Four ships. HMS Hecla (A133), HMS Hecate (A137), and HMS Hydra (A144) were built by Yarrow & Co of Glasgow in 1965-66. HMS Herald (H138) was built by Robb Caledon and completed in 1974. LOA 79 metres, beam 15.4 metres; speed 14 knots. Engines: Three 12YJCZ (Ventura) main engines, each rated 1,165 bhp at 1,250 rpm, and two 6YJXZ auxiliaries, per ship. Electrical Machinery: Main engines directly coupled to tandem DC generators, 610kW for propulsion and 200kW for hotel load. Auxiliaries driving 220 volt, 300kW DC generators. One propulsion motor, producing 2,000 shaft horsepower, driving a single propeller. Electrical machinery manufactured by AEI (Associated Electrical Industries), Rugby. Engines: Two 16YLCZ engines, each developing 2,270 bhp (continuous) at 750 rpm and 2,497 bhp overload, per dredger. The engines were despatched from Paxman during March, April and June 1966. Electrical Machinery: Each engine coupled to tandem generators, 1,200kW for propulsion and 200kW auxiliary, supplied by AEI of Rugby. Combined electrical output from each set 1,400kW continuous, 1,540kW on overload. 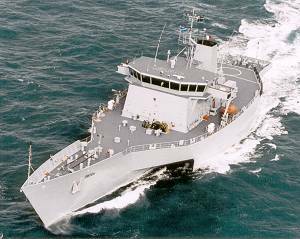 Sixteen Duke Class frigates designed and developed by Yarrow Shipbuilders Ltd in collaboration with the MOD(N). Their anti-submarine warfare (ASW) role dictates a need for very quiet running with minimal background noise from machinery. To meet this requirement the Type 23 has a CODLAG (COmbined Diesel-eLectric And Gas turbine) propulsion system. Diesel-electric propulsion is used when the ship is in 'slow speed silent mode' or when manoeuvring or cruising. For high speed operation, boost is provided by two Rolls Royce Spey SM1 gas turbines. The first set of four Paxman-engined power modules for the Type 23 programme was delivered in Spring 1986. LOA 133 metres. 4,000 tons. Engines: Four 12RP200CZ (Valenta) engines per ship, running at 1,200 rpm. Each powers a generator set module mounted on a fabricated steel raft. Two of the four modules per ship are double mounted and contained in acoustic enclosures to minimise noise and vibration. The modules were built and fitted out by Paxman at Colchester. Electrical Machinery: Each module has a continuous power output of 1.3MW, 440/600 volt, 3 phase, 60Hz. The four modules provide power for the diesel-electric propulsion system and all other on-board electrical requirements. Two 1.5MW, 750 volt DC variable speed propulsion motors, in which speed is varied by both armature voltage and field control, each driving a propeller shaft with its fixed-pitch propeller. Each motor is fed from a 600 volt AC input, 750 volt DC output, 1.65MW thyristor converter. The electrical machinery and propulsion control equipment were supplied by GEC Electrical Projects Ltd, Rugby. Four Type 2400 SSK 'Hunter/Killer' submarines, HMS Unicorn, HMS Unseen, HMS Upholder, and HMS Ursula, built for the Royal Navy between 1986 and 1992. A key feature of these boats is their exceptionally quiet running and small acoustic signature made possible by the diesel-electric propulsion arrangement. Due to Government defence cuts in 1993, the plan to build ten Upholder Class boats was halted, and the four which had been built were taken out of service. 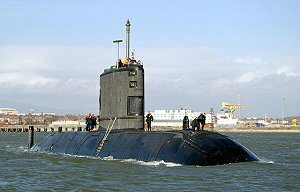 They were sold in 1998 to the Canadian Navy which designated them the Victoria Class and renamed them Windsor, Victoria, Chicoutimi, and Cornerbrook. Engines: Two 16 cylinder RPA200SZ Valentas for main propulsion, and two 6YJXZ auxiliaries, per vessel. Each main engine has a maximum continuous rating of 1,500 kWb (2,010 bhp) at 1,350 rpm. Maximum overload rating: 1,530 kWb (2050 bhp). Maximum engine speed: 1,418 rpm. The turbocharger normally fitted to a Valenta was replaced on these engines by a single supercharger, gear-driven from the free end. The use of a mechanically-driven supercharger, insensitive to exhaust back pressure, enables well over twice the engine power to be produced compared with a normally aspirated engine and gives good cylinder scavenging under all submarine service conditions. Electrical Machinery: Two GEC brushless generators, each with an output of 1.4 MW, and a single 4MW, 5,400 shp propulsion motor turning a single propeller. A twin screw 1,200 tonne survey ship built in and for Korea by Daewoo in about 1994. It was fitted with a combined diesel-electric and diesel-mechanical propulsion system. A special requirement was that the ship should be able to cruise very quietly and slowly whilst surveying. For this work the diesel-electric propulsion system is used. Main propulsion for normal cruising is by two Paxman Valentas, each coupled to a propeller shaft through a gearbox. 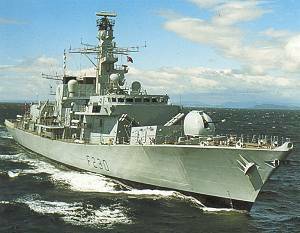 Because of its experience with diesel-electric systems, particularly on the Royal Navy's Type 23 Frigate, Paxman was selected as the main contractor for the complete machinery fit. The supply included everything from the propeller hub up to, but not including, the main switchboard. Design speeds were 9 knots in diesel-electric mode and 14 knots when using the diesel-mechanical arrangement. The vessel has proved very successful, achieving an actual speed about 2 knots greater than the design speed in each mode. Each shaft line has a single control lever and transitions between diesel-electric and diesel-mechanical modes are so smooth they are imperceptible to the operator. Paxman's Engineering Manager, Kevin Hosking, was mainly responsible for the mechanical side of the project with Eric Wesbroom, Principal Applications Engineer, looking after the electrical aspects. Geoff Gant and Neil Pears of Regulateurs Europa, Paxman's governing and control business, were mainly responsible for the control aspects of the two propulsion systems. LOA of the vessel is estimated to be approximately between 65 and 70 metres. Engines: Two Paxman 12RP200 (Valenta) engines for main propulsion in diesel-mechanical drive mode, each directly coupled to a Renk reduction gearbox fitted with a clutch on the output shaft immediately in front of the thrust bearing. Electrical Machinery: Three 350kW generator sets, each double resiliently mounted in an acoustic enclosure, built by G & M Power Plant of Ipswich. (The sets are powered by Cummins engines as Paxman ones would have been too powerful for the requirement.) One 195kW DC electric propulsion motor driving each propeller shaft, the motor being part of the shaft line as on the Type 23 Frigate. A demonstrator trimaran frigate built for the Ministry of Defence's Evaluation and Research Agency (now QinetiQ) by Vosper Thornycroft. Launched in 2000, it was a two thirds scale prototype of a vessel which was being considered at the time as a possible eventual replacement for the Royal Navy's Types 22 and 23 Frigates. The triple hull design reduces drag by 20% compared with a comparable conventional monohull vessel. RV Triton was sold in 2004 to Gardline Geosurvey of Great Yarmouth, who carry out ocean survey work. Engines: Two 12 cylinder VP185s, rated at 2MWe each. Acknowledgement: I am indebted to Don Meiklejohn, Technical Support Engineer, MAN B&W Diesel Ltd, Paxman, for researching and providing detailed technical information on several of the installations described above. Also to Gil Wilson, formerly Sales Manager, GEC ALSTHOM Paxman Diesels Ltd for information on the Korean survey ship. Information on other vessels, or classes of vessel which ought to included on this page would be appreciated.